The Classic Car Club of Ceylon kicked off its silver jubilee celebrations with the Heritage Hill Climb, where 50 classic automobiles made the scenic journey upcountry, making the historic Mahagastota Hill Climb. Many of the automobiles began the journey from Colombo, with members setting out to Kandy. The convoy headed to Gregory Park in Nuwara Eliya the following day, where the classics were lined up for photo shoots with Lake Gregory and the hills of Nuwara Eliya in the background. 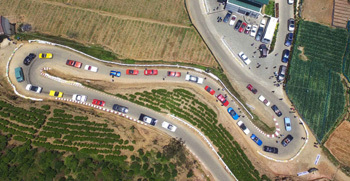 After breakfast at Gregory Park, the cars – led by the police motorcycle patrol and the Mercedes-Benz course car – reached the top of the Mahagastota hill.